What can two games tell you? We know that a two-game sample is much too small to be predictive in a good statistical analysis. At the same time, through two games, the Penguins have provided distinct areas for fans to keep their eyes on as the season progresses, including shot suppression and special teams. Their 0-2 start is hardly what anyone expected after an offseason that included a blockbuster trade for Phil Kessel, but if the Penguins want to have success, they are, simply, going to have to score more goals. Taking advantage of the power play is a good place to start. In just over a year, the power play went from being one of the Penguins’ greatest strengths to what feels like a routinized exercise in futility. In 2013-2014, the Penguins had the top power play in the league, converting on 23.4% of their chances; in contrast, after a hot start in 2014-2015, the Penguins dropped to 10th in the league, converting on 19.3% of their chances. Perhaps even more concerning is that the Penguins were not only less efficient on the power play, but they were also less successful at keeping the puck away from their opponents when they were up a man than they had previously been. In 2013-2014, the Penguins had a 91.7% goals for percentage (GF%) on the power play, which was top 5 in the league. By 2014-2015, that number dropped to 83.5% GF%, good for 28th in the league (only Toronto and Buffalo were less efficient than Pittsburgh at keeping the puck out of their own net while on the power play). In short, the Penguins were not only scoring on fewer of their power play chances, but they were also bleeding shorthanded goals against. The 11 shorthanded goals allowed by Pittsburgh were better than only Toronto (who allowed 12); no other team in the league allowed more than 8. At worst, the power play should be two minutes where the other team isn't scoring on you, but the Penguins struggled in this category; with some questions about the Penguins' blue line and their shot suppression abilities, the Penguins must remedy this in 2015-2016. Further, though it’s often cited that the Penguins didn’t receive many power play chances last year, they were awarded 254 power play opportunities, a number that had them tied for 12th in the league in power play opportunities, so slightly better than league average, and a ranking that left them in the exact same position they had been in the year before. Overall the Penguins may have been awarded fewer power plays last year compared to the year before, but no change in their ranking tells us that the number of power plays they were awarded relative to the rest of the league remained the same. It is unlikely, then, that a league-wide conspiracy against the Penguins explains the drop in power play opportunities awarded; instead, the Penguins must accept that power play opportunities are becoming more scarce—all the more valuable for it—and work to get back to previous levels of scoring efficiency. Turning to the two games we have seen of the 2015-2016 season, with the addition of Phil Kessel the Penguins were certainly counting on having some of their power play woes taken care of and, although Kessel has scored the Penguins’ lone goal in the 2015-2016 season, it wasn’t on the power play. Most of the Pens’ power play time to date has seen a split-unit set up that featured Malkin on the second power play and Crosby on the top unit with Kessel. Under the two-power-play format, the Penguins have gone 0-for-7, making them one of only three teams in the league with at least 7 power play opportunities and no goals to show for it. And although they are bound to score a power play goal eventually, the Penguins could help themselves by maximizing their players’ talents, which means Malkin on the top power play unit. Thankfully, the Penguins rolled out a heavily loaded power play against Arizona, with Malkin, Crosby, and Kessel on the ice together (and Hornqvist and Letang to round them out), after unsuccessfully trying the two-unit format earlier in the game. Based on both individual shot attempts and power play points per 60 over the last two years, the top power play unit for the Penguins should consist of Malkin, Kessel, Crosby, Letang, and Hornqvist, so statistics support the unit the Penguins used during the Arizona game. After the loss against Arizona, Malkin was asked if he would like to play with Crosby and Kessel on the power play, were he coaching the team. “Of course I’m like. 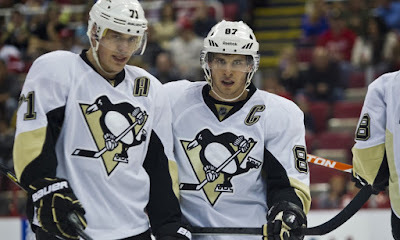 It’s more confidence, you step on ice and just play with Sid,” Malkin said. Malkin also added that he felt Crosby was a good power play partner but admitted he was not the coach. Hopefully, Johnston will continue with one power play unit composed of the Penguins’ top 4 forwards (and Letang). Of all Penguins forwards, Malkin has had more individual shot attempts on the power play than anyone over the last two seasons. Only Kessel (with 28.54) comes close to Malkin’s power play individual Corsi per 60 of 31.55. He’s earned his spot on the top unit. The Penguins must put themselves in the best position capitalize on increasingly rare power play opportunities, while also finding a way to keep the puck in their own zone (and out of their net). Consistently playing their five best players would be a good place to start.